The Parkerville Tavern invites you to enjoy a magical evening under the stars with Monty Cotton, one of Australia's best performers this New Year's Eve. On Sunday 31st of December, 2017, Monty Cotton & his band are presenting a tribute to the legendary Johnny Cash on the amazing Parkerville Tavern outdoor stage. Doors open at 5pm and the concert starts at 7pm with well-respected solo artist, Craig Dunkling playing a few favourite covers to warm up the crowd! The show will run until midnight with Monty counting us all into the 2018 New Year! Monty Cotton has performed his acclaimed Johnny Cash tribute all around the country in a variety of venues, including pubs, clubs and arts festivals, as well as on breakfast radio, morning television, and 'The Voice' Australia. 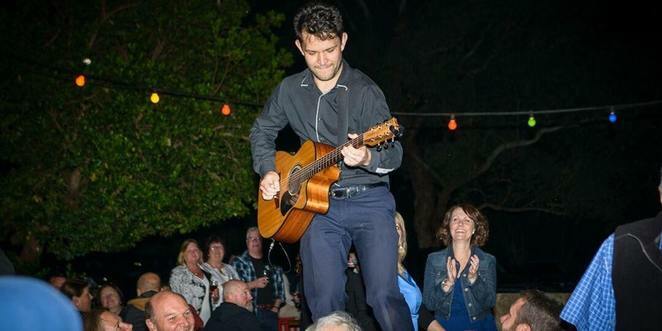 Having sold out shows at Edinburgh Fringe (2016 and 2017), Adelaide Fringe (2016 & 2017), Perth Fringe and leading club venues, this will be a rare opportunity to see Monty Cotton & his band perform an intimate outdoor show! This New Year's Eve event is family-friendly - bring your friends and the kids along and enjoy wood-fired pizza, a selection of delicious meals from the a la carte menu and refreshing beverages throughout the evening! What a way to say goodbye to 2017 and begin the new year! All are welcome to attend this special Twilight concert and New Year's Eve event at Parkerville Tavern. Tickets are available on Eventbrite now and priced as follows: $20 for Adults, $10 for Kids (13 to 18) and Kids under 12 receive FREE entry. "You hit that so perfectly" - Larry Emdur, Seven Network's Morning Show commenting on Monty's Johnny Cash live showcase appearance. "With closed eyes, it could have been the real Cash standing on stage, Cotton's voice being absolutely spot on" - Edinburgh Spotlight.